If you are planning your next marketing campaign to pitch your products, solutions or services in New Zealand, Blue Mail Media can help you with highly accurate and dependable marketing data to meet the objective. 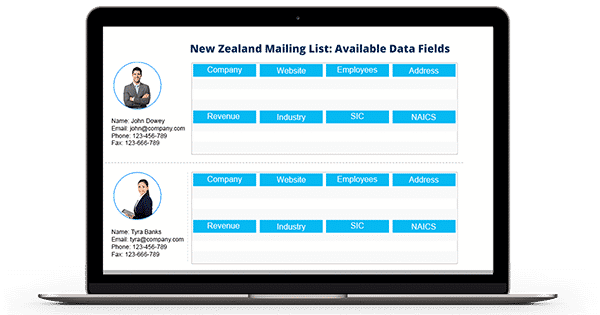 Our New Zealand Email Database has been prepared to give you access to complete marketing information to reach your prospects via telephone, email or mail. We house an adroit team of experts, data scientists, and professionals to support your marketing drive the best possible way. Our New Zealand Business Executives Mailing List can power you to get in touch with top level executives and decision makers in numerous industries with a lot of ease. No matter which region you operate in, Blue Mail Media is capable to help you proactively, reasoned to our strong data partner network across Europe, USA, UK, Canada, North America, APAC and other regions. We make sure that our data helps you meet your business specific objectives, and thus, we provide you with pre-packaged List of New Zealand Business Executives as well as customized mailing list based on your specific preferences. Blue Mail Media’s team carefully accumulates data from authentic sources and extract result-oriented intelligence to help clients achieve their marketing objectives. Our team follows stringent data verification process to make sure our data remains free of redundancies and our clients achieve higher response on their campaigns.